SRAM PG-1050 10 Speed Cassette (11-26). I found this on eBay (Buy It Now!) for a really good price and I think I saved $20 going this route. 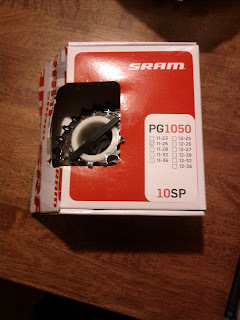 According to my Roadie Guru, this cassette might be a little tall for my ability so I am going to ride it and see how it goes for now. What I might try to do is get a 12-30 and at get a smaller geared crankset with smaller arms (175). 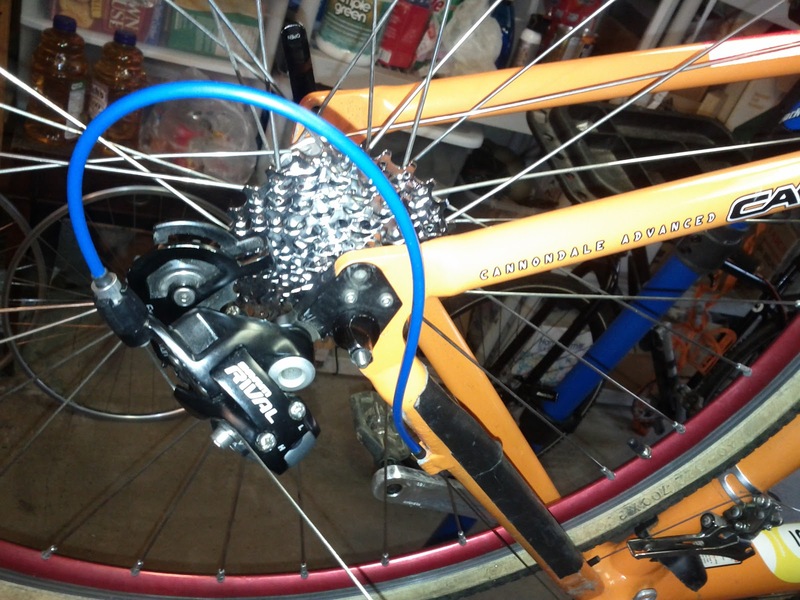 For the time being I think I will be OK for a more roadie drive train. The average price for SRAM TT 500 bar end shifters seems to be between $96 and $150 and I was about to get them from some UK online bike parts retailer for $94 when I found a pair on Amazon for $84! The picture above is exactly what I got. 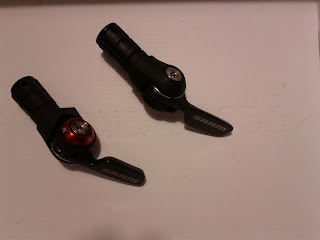 Just what the seller advertised, a pair of Sram Tt500 TT/Tri 2X10Sp Bar-End Shifters, Front/Rear Set, "BAM!" 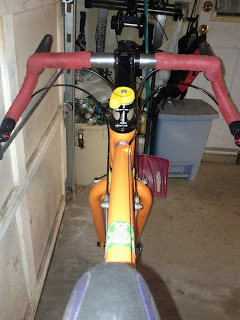 No box, no instructions, just a pair of bar end shifters. Can't find much on the seller but it was a great deal that couldn't be passed up! Maybe they were used but I couldn't tell because out of the package they looked brand new. 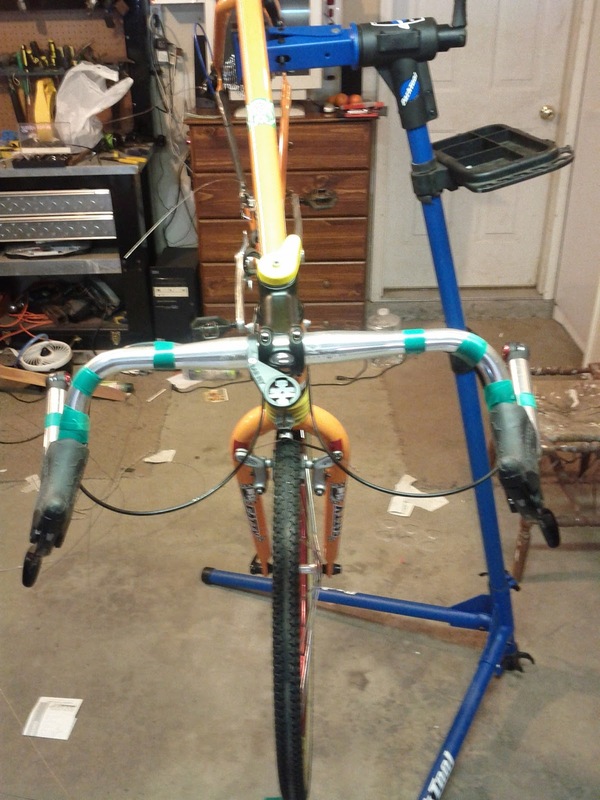 The new seatpost looked great with the bike because it had some orange accents but when I found the right position for it which was just about all the way down I didn't see how this would differ much from a much shorter aluminum one that I had laying around. 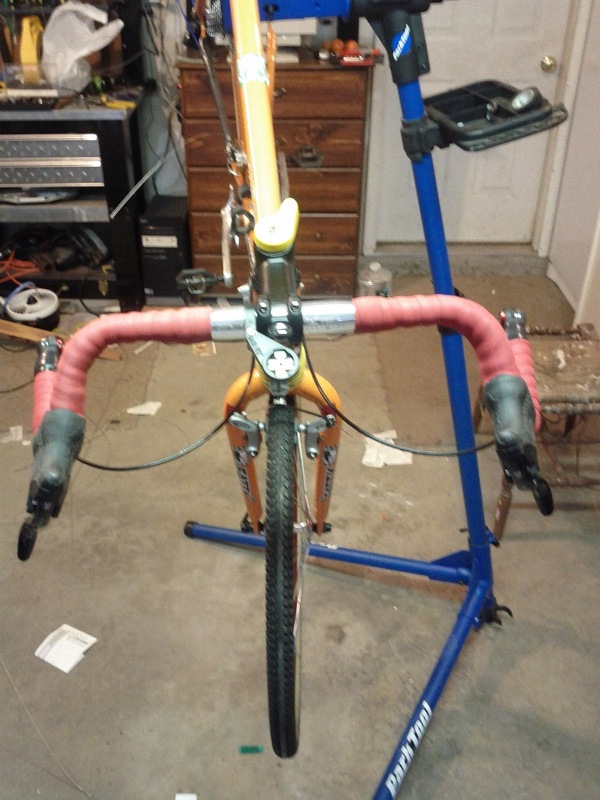 My thought is that more carbon fiber between my fourth of point contact and the frame means there is a greater dampening or absorption effect by the seatpost. I put this on the Qball and went back to the original aluminum one. 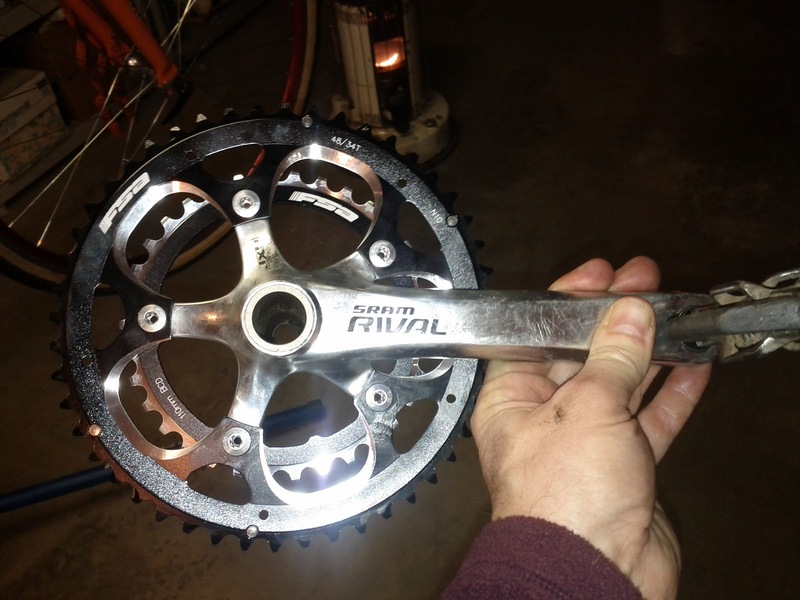 The FSA chainrings were a perfect fit for the SRAM Rival cranks and they look really good, too. 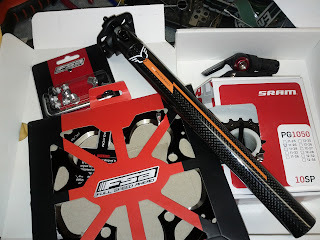 As I mentioned earlier, I am probably going to get another crankset with 175mm crank arms and I might even decrease the teeth for both rings, maybe a 44/32 like a mountain crankset. 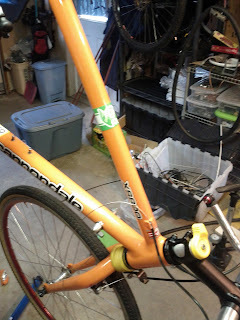 During the build I added a very important Sandy Hook Ride on Washington decal! My wheelset is Dura Ace hubs and Mavic rims. 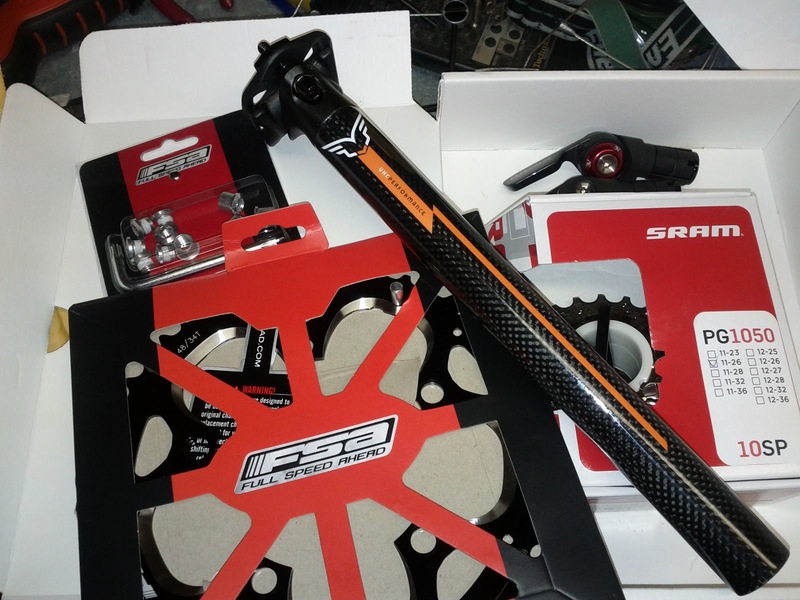 The bearings in the hubs are awesome! Again, another Fred-ism here: how colorful do I want to go with the bar tape? My choices were orange, purple/white, red/white/black, and red. 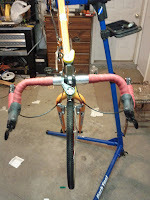 While the orange actually matched the frame I thought it would be too orange. Can you have too much orange? Red/white/black wasn't going to work so it was between the purple/white and red. I couldn't decide so I asked my son, Elliot to help me. He pointed out that the red would go nicely with the red rims so red was it! 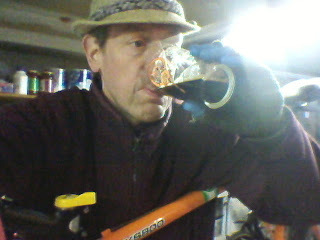 Like the red bar tape, and bar end shifters, I wouldn't be true to Freds across the world if I didn't had a few more Pieces of Flair. All I had left in my box of tricks for gear cable was this blue piece. 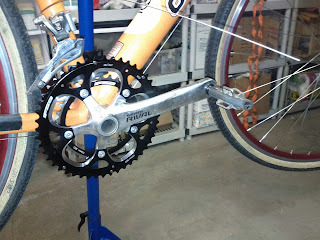 Here are the cranks mounted. 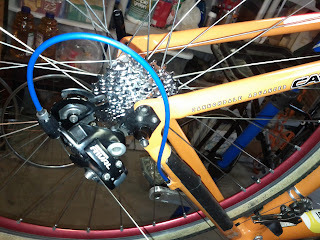 I spent quite a bit of time trying to adjust the front derailleur but couldn't get it to work properly. I took it in to the Brookfield Bicycle Center and the experts there looked at it and said the reason it was behaving as such was due to the cage (or whatever you call it) was bent. The Gany Porter was consumed to celebrate the completion of the build. 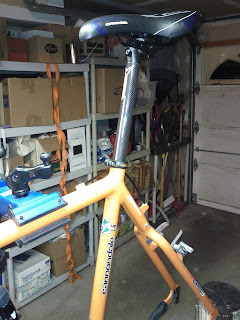 Final build pix will be in the next post! 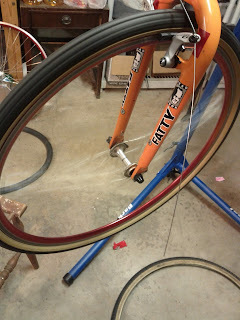 It's missing the spoke protector! It came with a pie plate?